Walker Ceramic pride ourselves on the quality of our products and after-sales service. We provide full technical backup and we are happy to assist clients to develop products to their specific requirements. All of our products are tested in our laboratory prior to release for sale. Batches of clay and glaze are routinely tested thoroughly before distribution. The expansion of the body or glaze is automatically graphed whilst the sample is heated at a set rate. The samples are small bars which have been pre-fired to the recommended firing temperature. This test confirms clay/glaze fit. To rapidly determine the percentage of moisture content of a material. To test the fluidity and thixotropy of slips. This is a very important test to ensure the slips will pour, cast and drain well. This is to test bodies and glazes over a temperature range to a maximum of 1325°C in the one firing. The rate of temperature rise and soaking time is automatically controlled. The kiln fires 10 separate samples with about 30°C temperature difference between each, thereby we have an accurate firing history of water absorption, shrinkage and colour over a 300°C range to over the body’s maximum temperature. The test samples are then compared to our standard results. Other test equipment includes an Automatic Drier, Ford Cup and Walker Fluidity Cylinders, Ball Mills, High Speed Rapido Mills, High Speed Shear Agitators, Sieve Testing Screens and test kilns. Standards for all clays, glazes, colours and raw materials are kept for reference. An important part of the daily program in the laboratory is time spent in research and development. 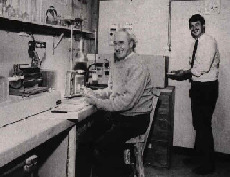 The late Geoffrey Walker, the founder of Walker Ceramics, with his son David in the laboratory.